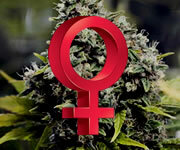 Feminized Seeds | Buy Cannabis Seeds Fully Feminized Guaranteed! This Gorilla is a feminized bean expert. If you need feminized cannabis seeds you know you can trust, then you're in the right place. Gorilla Seed Bank works incredibly hard to ensure that each & every single one of the feminised beans that it offers is tested to the absolute limit so that you always get exactly what you expect. How great is that? Get Your Feminized Alien OG Seeds Now! No lipstick or surgery is required to create a seed which is 100% feminised. All you need is some regular seeds, a Gorilla Grade expert and some shock tactics. It’s a bit like genetic engineering but cooler. Depending on the breeders own personal preference, regular seeds are stressed using one of a range of techniques, then placed back with their exact kin. These then ‘do the bad thing’ and a few weeks later the seeds produced are 100% feminised. Gorilla checks and verifies the safety, purity and femininity of every single seed from every single breeder, no matter how famously awesome they are, just to be sure that your feminised seeds are perfect. Feminised beans of the calibre on offer at the Gorilla Seed Bank have been long awaited. Now they’re here, they are the best option for cannabis seed fans with any sense. Not so long ago feminization was a bit ‘hit and miss’, leaving many seed fans disgruntled. But with the rapid development and eventual perfection of the feminization technique in the last few years, they are now a super reliable option for all. If you want to own a seed that can reliably produce female results, then look no further. Get Your Own Fem Seeds Today!